Is there anything headier, happier and more confusing than first love? Of course not. That sensation is captured perfectly in Wes Anderson’s “Moonrise Kingdom,” as wonderfully odd and formal a film as Anderson has made. Even in Anderson’s detail-oriented obsession with symmetry and control of his images, he manages to let the unpredictability and volatility of young love burst through at unexpected moments. Anderson’s film, opening in limited release Friday (5/25/12), is, ostensibly, a comedy. But its humor and its joys are never the obvious sort that most movie comedy uses as oxygen. 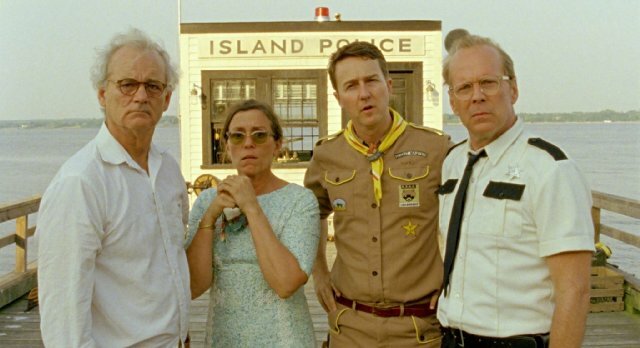 If anything, there’s a certain giddy airlessness to Anderson’s films in general – and to “Moonrise Kingdom” in particular. And yet that cinematic hypoxia creates its own kind of high, if you can adjust to the altitude. Not everyone can – nor will everyone want to. No doubt Anderson will be tarred once again with the brush of quirkiness, as though he were some camera-toting Zooey Deschanel, shooting whatever struck his fancy and giggling about it afterward. Nothing could be further from the truth. Rather, Anderson has a story to tell and a very specific way he wants to tell it. He’s not disregarding the audience; he’s simply not pandering to it. The audience has to meet him halfway. If they do, they’ll find a rich, strange parallel world – essentially another corner of the same universe in which the characters of his other films dwell (including the stop-motion figures in “Fantastic Mr. Fox”). Set on an island that feels like New England (though Anderson makes a point of never mentioning which state we’re in, other than an Andersonian one) in September 1965, the story is centered on two preteens: Sam (Jared Gilman) and Suzy (Kara Hayward). Suzy lives on the island with her parents (Bill Murray and Frances McDormand) and her three younger brothers. 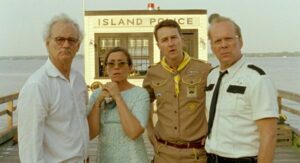 Sam is a regular summer visitor to the island as a member of the Khaki Scouts (a Boy Scouts analog), which has an island encampment, run by Scoutmaster Ward (Edward Norton). Sam “resigns” from Scouts, escaping from his tent to meet up with Suzy (with whom he has been corresponding during the school year). Their epistolary relationship has struck sparks of youthful romance, though neither of them is all that sophisticated about what that entails (because it’s 1965; with 12-year-olds today, forget about it).